It’s no secret that we Brits love coffee. In fact, the British Coffee Association estimates we now drink a staggering 95 million cups of coffee a day in the UK – up from 70 million in 2008. That’s 2 cups a day on average with some of us on the more extreme end of the scale drinking up to 6 cups! And with every cup comes that dreaded coffee breath! Luckily brands like Listerine are astute enough to realise the need for mouth freshening products that fit in with our everyday lives lived constantly on the go. Listerine Go! Tabs are a whole new way to clean whilst you’re busy out and about. Whether you’re on public transport, dashing to a meeting or leaving your favourite Coffee Shop, these chewable tabs turn from solid to liquid in seconds leaving your mouth feeling as clean as brushing and rinsing at home. Just chew, swish and swallow for a clean feeling that leaves you ready to take on the world. In one of our most exciting campaigns this year, Listerine are sampling 100,000 of their Listerine Go! 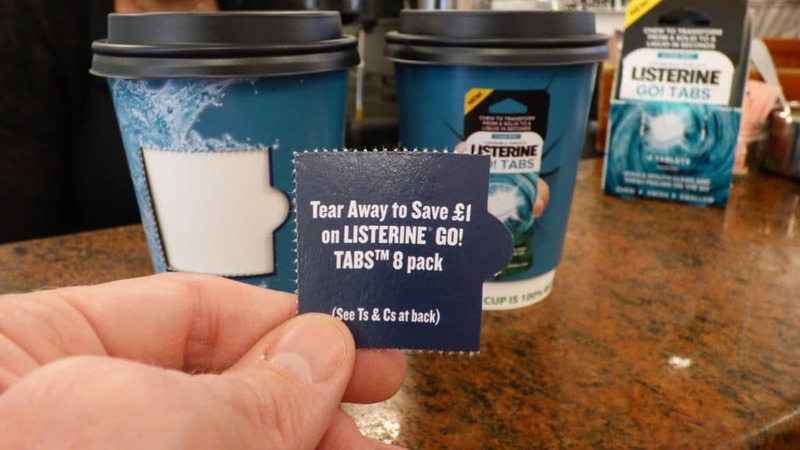 Tabs in 100 Coffee Shops across our Tabletalk network using an ingenious combination – branded sampling dispensers on the counter, along with branded takeaway coffee cups with an integrated tear-off coupon giving consumers £1 off a pack of 8 Listerine Go! Tabs available in stores nationwide. This is targeted and tactical ambient media at its best.